All needles, inks, gloves, ink caps we use for tattooing are disposed after use. Reusable tools such as tubes or Tebori sticks will be washed by ultrasonic cleaner and sterilized with the autoclave machine. Born in 1984 in Fukui prefecture. He started his tattooing career in London when he was 22 years old. He came back to Japan soon after and started learning Japanese traditional tattooing with self-education mostly in Tokyo and Fukui. He started working at “CULT CLASSIC TATTOO” in 2010 where he still visits often for the guest work. 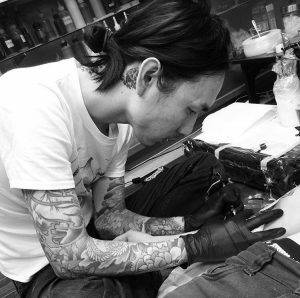 After exploring a world and doing guest work at great tattoo shops in Europe, He opened his own shop in Fukui which is “HORITSUBAKI TATTOO”. 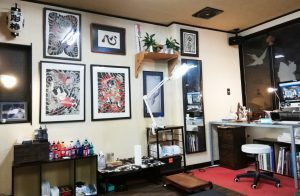 He joined the legendary tattoo studio “GOKURAKUTEN” in Fukui in 2019 where he studies and creates Japanese traditional tattooing.